Shane Darwent’s studio is filled with things. Dotting over the floor or ensconced like curios on a shelf, one can find, among many items, a plastic scooter, a doghouse, a braid of artificial hair. These objects once held a meaningful purpose, but the wheel cracked, the roof leaked, and the hair fell out. Literary critic Bill Brown theorized that objects become “things” when the relation changes between people and what they own. “We begin to confront the thingness of objects,” Brown wrote, “when they stop working for us: when the drill breaks, when the car stalls, when the windows get filthy, when their flow within the circuits of production and distribution, consumption and exhibition, has been arrested, however momentarily.” [i] The artist’s studio is flush with things that have stopped working, but that is precisely why they work for Darwent. Biking though the Southside of Chattanooga, Tennessee, where he lives and works, Darwent scans the landscape for things. Like an anthropologist, he is fascinated by how objects have been adulterated for a function; how details can speak of labor and love; and how a patina elicits the effects of wear, tear, and time. Darwent pieces the discards of his neighborhood into sculptures that speak of these imagined former lives, as they take on new complexity as forms. The Flood originated with the collection of a discarded Styrofoam cup, the kind found stacked next to coffee machines in gas stations (fig. 1). Its effervescent graphics, like thrown confetti, now scatters across the base of The Flood (fig. 2). Out of the foundation rise other found objects: a teal and white pool ladder, yellow plastic pipes, a purple bicycle seat, a red broom handle. 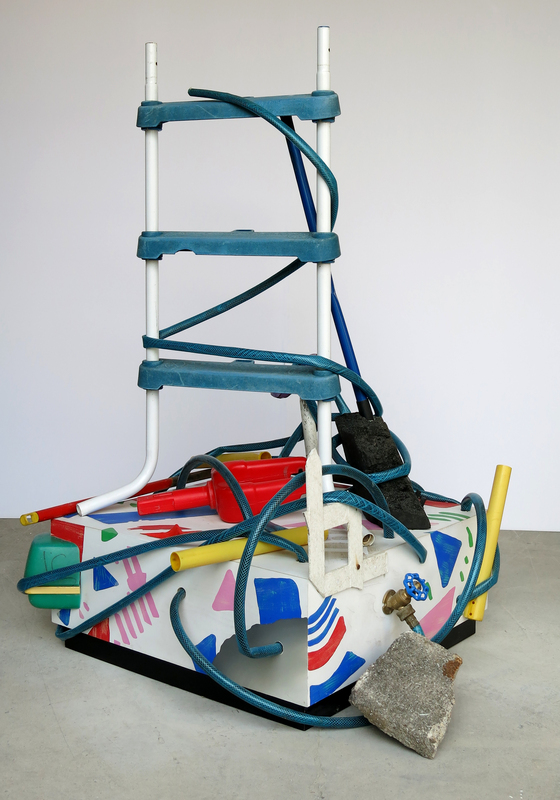 The sculpture becomes the Styrofoam cup writ large, expressing the dynamism of bold colored forms in space. A blue water hose wraps and holds the disparate forms together, weaving around the nose of the weathered bicycle seat and up the ladder like a vine, or, more akin to the diamond pattern on its rubber surface, a snake. 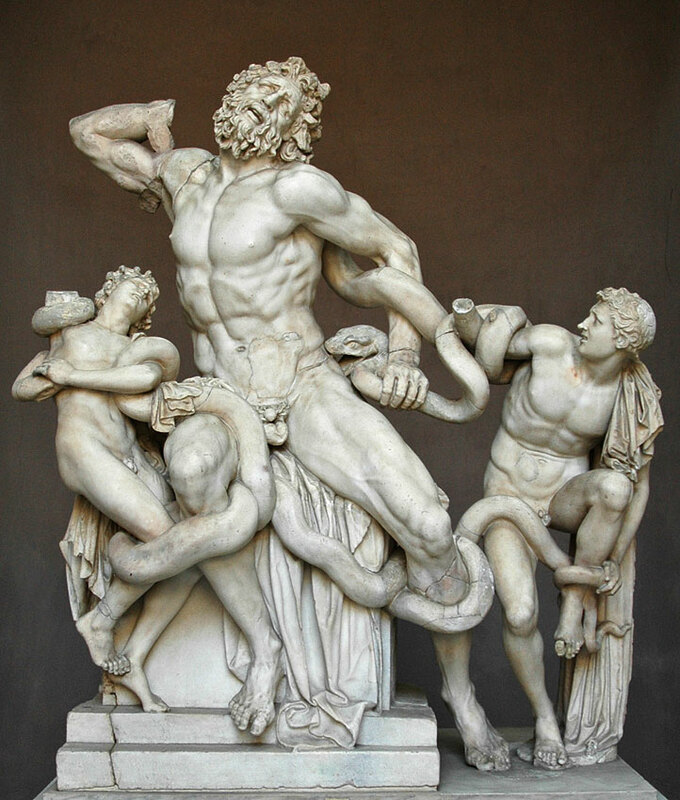 Looking at this work, I had a chilling recollection of the ancient sculpture, The Laocoön and His Sons (fig. 3), which reenacts the story of the doomed Trojan priest in Vergil’s Aeneid, strangled by sea serpents sent from the gods. This evocation of being tied down, immobilized by outside forces, adds a layer of social urgency onto Darwent’s playful formalism. The Southside contains within its geographic border two halves: one of the most depressed areas of the city next to the most recently gentrified. Growing up in Charleston, South Carolina and attending college in Baltimore, Maryland—two cities known for deep economic disparity—Darwent evokes the Southside both in its particularity and its generality. Poverty hand-in-hand with affluence could be, and is, anywhere. The works of this exhibition revert attention back towards these communities, to areas beyond the city’s “revitalization” and visibility, to reinvigorate value in things outside gentrified circuits of production and distribution. Towards this purpose, pedestals are a pivotal structural and metaphorical element in Darwent’s sculptures. By elevating the detritus from the ground, the high/low dialectic is upended, instigating a new way of interacting with these materials. A stack of pastel purple tires from a child’s tricycle sits atop A Tired Ballad (fig. 4). Each tire has been cut and reconfigured, its tread a tactile frieze of nubby plastic. The pattern is picked up again in a doodled pencil and fluorescent yellow helix form, like a high frequency wave, that wraps around the side of the plinth. Slick Caution tape, a green wire hanger, rudimentary letters gouged into wood, and furious scribble marks also cover the sides, activating the white space of the ground, but also defacing the academic history of the pedestal. In this way, the sculpture destabilizes traditional materials equally as traditional modes of display. A fundamental motive of Darwent’s practice is mining the relationship between people and things from purchase to severance, and, more broadly, how this relationship affects our landscape. By choosing items destined for the landfill as part of his palette, Darwent creates an alternative economy and system of value. He uses joinery and woodworking techniques to reconfigure machine-made objects into works that initiate conversations on how we interact with the environment. 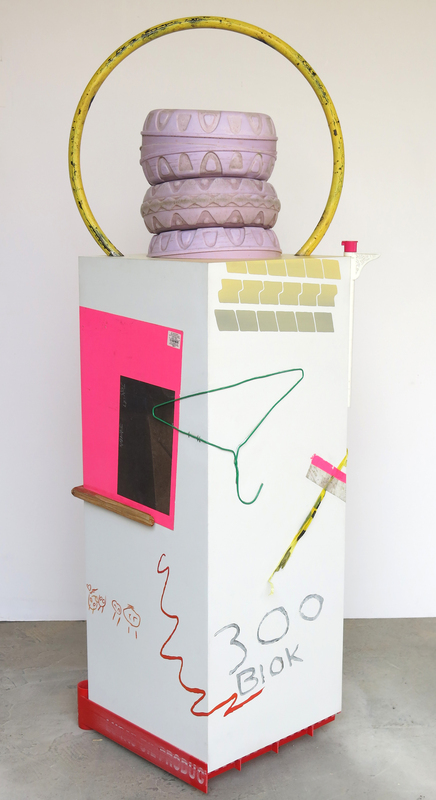 Radiating over A Tired Ballad is a golden arc of a former stool that had been broken into unsalvageable pieces, memorializing how regeneration can bloom out of objects (or ideas) seemingly foregone. In addition to his assembled sculptures, Darwent also works in other media to survey the ways in which products, people and place coalesce. In Twilight on Chamberlin Avenue (fig. 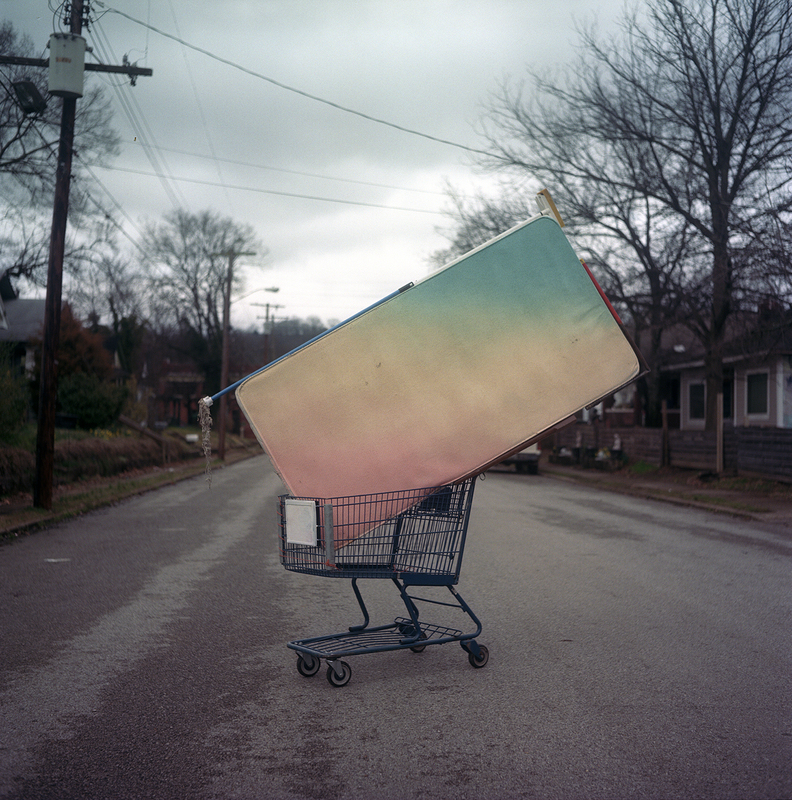 5), a photograph distills in a frame Darwent’s performance of rolling a shopping cart, awkwardly balancing a twin mattress, airbrushed like a sunset, down a street near his studio. Such a conspicuous, excessive gesture drew attention from his neighbors, instigating conversations—some about art, some with artists who shared that they, too, liked making things. Yet Darwent shrank the photograph of this event down to the size of a Polaroid, limiting the viewer’s vicarious visual experience. Instead, he amplified an audio recording of ambient sound sourced from the same street: the rattle of his grocery cart, dog barks, the wail of a fire truck, police car sirens. While no artwork can ever replicate lived experience, Darwent overwhelms the aural senses of the listener to convey the phenomenological effect of how place can shape a subject. In the end, the roving shopping cart embodies Darwent’s practice and its mission: turning normative modes of consumption on its head by collecting the obsolete. In effect, he draws attention to the materiality and ecology of an invisible city. These works offer a counter-narrative of the Southside, a revision of the map for those who think life ends where the restored buildings, coffee shops, and juice bars cease to stake claim. [i] Bill Brown, “Thing Theory,” Critical Inquiry, Vol. 28, No. 1 (Autumn, 2001), 4. [ii] Susan Strasser, Waste and Want: A Social History of Trash (New York: Macmillan, 2000), 14. Rachel White is the Assistant Curator of Education at the Hunter Museum of American Art in Chattanooga, Tennessee. She completed her MA in art history at George Washington University in Washington, DC and is currently pursuing her PhD in art history at the University of Illinois Urbana-Champaign.